Title : CARTE DU DETROIT DE COOK DANS LA Nle. ZELANDE. Map maker : COOK, James. Size : 10.8 x 10.8 inches. / 27.5 x 27.5 cm. 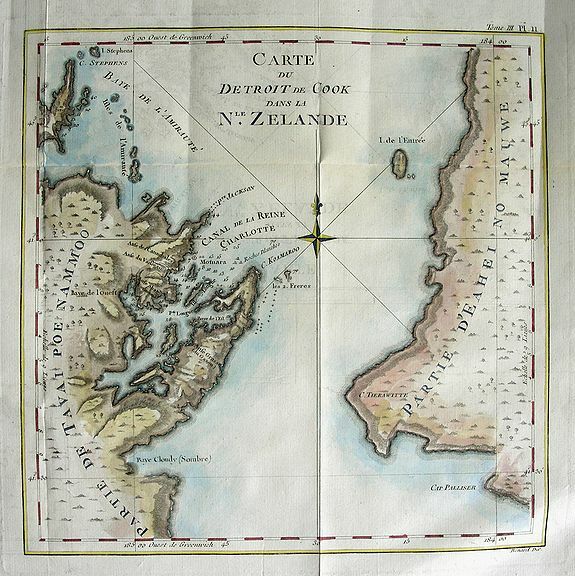 Description :Very important map showing Cook's Strait, which separates the North and South islands of New Zealand. Present day Wellington, Marlborough Sounds, and Cloudy Bay are depicted. One bay is named "Bay of the Cannibals"! With very attractive later hand-colouring, and decorated with a fleur-de-lys. The chart also includes numerous depth soundings to help navigation. This chart is from the first French edition of Captain Cook's first voyage. Tomme III, Plate 11. Engraved by Benard. Condition : Excellent dark and clear impression, printed on quality hand-laid paper. With very light uneven toning and faint off-setting. Horizontal and vertical folds as issued. In very good condition!